Kitchen renovations require a large investment of time, effort, and money, and it’s often difficult to decide what you want, how to do it, and when to do it. The many choices available can be overwhelming and often leave you confused. 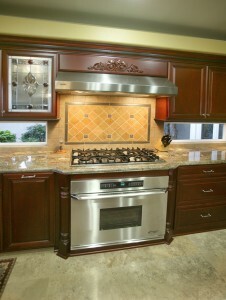 At Reborn Remodeling Solutions, we specialize in remodeling and renovating kitchens in homes in and around Orange County. We are a licensed, bonded, and insured home remodeling contractor as well as a proud member of the National Kitchen and Bath Association, and we’ve handled thousands of stunning kitchen renovations since 1983. Simply meet with our experienced kitchen designers from Team Reborn and they will help you sort through the endless list of options, and decide upon the ones that will turn your ordinary kitchen into the kitchen of your dreams. Best of all, you can choose to have our designer bring the showroom to your home, or you can visit our design center in Anaheim, open 7 days a week, where we have over 30 kitchens on display. We are proud of and confident in the craftsmanship and installation we provide. That is why we offer a 25-year warranty on all kitchen renovations. However, our excellence in quality is not enough. We also seek to provide a level of customer service that is simply unheard of in our industry. We are a family-owned and -operated remodeling and cabinet company, and we take the time to ensure that what you desire is what you will receive. We will work diligently with you, keep contact with you at all times, take a genuine interest in your remodeling project, and ultimately leave you just as happy, if not happier, with our kitchen renovation service as you are with our products. This is what makes the kitchen renovations from Reborn Remodeling Solutions truly the The Ultimate Remodeling Experience®. For more information about the kitchen renovations Reborn Remodeling Solutions provides for homes in Orange County and across Southern California, please call us at 1-877-371-4943. Or, if you’d like to see our work in person, stop by our 40,000-square-foot showroom and manufacturing facility in Anaheim. We are proud to provide our kitchen remodel services to residents of Brea, Placentia, Huntington Beach, Los Angeles, Mission Viejo, Yorba Linda, Laguna Niguel, Santa Ana, Fountain Valley, and throughout other nearby communities in Southern California. "Love love love my new showers. Yes 2 of them. Luis Lopez &Tony V were the best. On time very clean and did a great job."